...with a young, developing QB and plenty of injuries at the skill positions, USC must lean on the D for victories! Jimmy Harbaugh finally has the Cards relevant again in the Pac-10 by playing with the swagger of a High School squad on a state championship ride. That being said, they still don't have the bodies up-front to match a team like the Trojans, so look for Stanford to crowd the box on D, while keeping things short & simple on O to give RS Fr. Andrew Luck' a chance to gain some confidence. While it's been a dream sr. season for one of the nations top & overused RBs, I expect USC to keep him under wraps! ...cause it's all about containment Homeboys! Especially with the Trojans D starting to get their confidence back after getting blow-up for a few weeks, look for Pete Carroll to keep the crowd in a frenzy with plenty of pressure to rattle the Trees young QB. As for the Trojan offense, while their banged-up at key spots, the main reason I'm underwhelmed with their attack is I'm still not convinced the frail Fr. 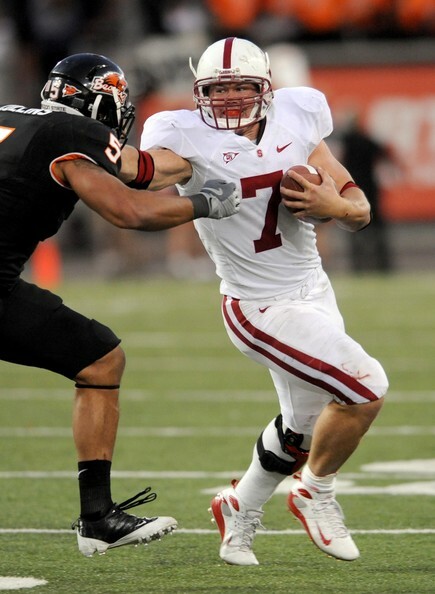 QB Matt Barkley (last week @ Az St: 7-22 112 yrds, Td, Int) is ever gonna be the real deal in College Hollywood. And sometimes fellas, it just comes down to size! Especially with the size advantage USC has up-front and the injuries on the outside, look for a conservative approach to wear down the overachievers from Palo Alto. As a result, I'm guessing we see a field position battle for most of the day with USC gaining a few more points each quarter...which means I'm rolling with the UNDA Homeboys! Final Score: STANFORD 17 USC 27..aka THE MFin UNDA! ...and may the sun show you in a great light! This page contains a single article from November 14, 2009 8:11 AM. The previous days article was Thursday Night ATS Winners & Women. The next days article was SUNDAY FUNDAY ATS PICKS & LADIES.